To some, it might sound like mission impossible. 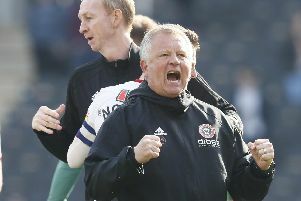 But for others, Nigel Adkins’ desire to see home-grown players eventually constitute half of Sheffield United’s first team squad is an eminently achievable aim. Wadsworth, a former England youth, under-21 and Newcastle head coach, is one of those tasked with meeting Adkins’ target after joining the Steelphalt Academy’s coaching staff in July last year. Three days ago, against league leaders Burton Albion, they actually came tantalisingly close to fulfilling that quota when Ben Whiteman and Dominic Calvert-Lewin joined fellow graduates George Long and Louis Reed on the pitch at Bramall Lane. Irrespective of whether they feature during tomorrow’s fixture with Fleetwood Town, football is littered with examples which highlight the rewards of daring to dream. “Barcelona base their whole philosophy on bringing players through and it hasn’t hampered them,” Wadsworth continues. “They seem to do pretty okay. “I remember reading a while back about the work Manuel Pellegrini did in Spain when he was with Villarreal. There were something like 60 players, in Spain’s top two divisions at one point, who had come through the ranks there. A phenomenal amount. The likes of Auxerre, West Ham at one stage, and Ajax built their models around home-grown talent so it shows it can be done. There are, although Wadsworth omitted to mention it, precedents further down the pyramid too. The Carlisle team he led to the 1995 Division Three title was powered by locally sourced talent from Cumbria. Earlier this year, United’s work at youth level gained official recognition when its academy, overseen by Nick Cox, was named the region’s best breeding ground for young talent by researchers working on behalf of the Premier and Football leagues. Wadsworth, who also worked as an FA technical co-ordinator before being appointed senior youth development coach in July, was not surprised having either coached or managed in all four tiers of the English game. “I sincerely believe this is one of the best programmes I’ve come across in the game. People like Nick, John Dungworth with the under-21’s and Chris Morgan before him, Travis Binnion with the under-18’s, Adam Pilling, Ash Foyle and countless others across all the age groups are doing some absolutely superb stuff. “Thanks to them, and they’ve been able to build on some excellent foundations as well, we have got a terrific country-wide reputation country-wide for bringing players through. It’s good to see the likes of Ben, Dom, Louis and George all involved and the manager (Adkins) has got a track record of working with youngsters as well. Calvert-Lewin and Whiteman, who made his debut for United during an FA Cup victory over Crewe Alexandra 16 months ago, are attempting to follow in the footsteps of Kyle Walker, Phil Jagielka and Stephen Quinn who gained international honours after progressing through the ranks at United. With all three now plying their trades elsewhere - Harry Maguire and Matthew Lowton have also moved on in recent seasons - questions have inevitably been raised about whether it is wise to invest so much time, effort and money in producing players. “There’s not even an argument to have,” Wadsworth, speaking at United’s training complex, says. “The best players, pretty much across the game as a whole, tend to get bought at one stage or another. And, if clubs don’t feel obliged to develop their own players, then where are they going to come from in the first place? I’ll tell you where, nowhere. Although they have established strong contacts in Northern Ireland and the Republic of Ireland, Cox recently told The Star that United’s academy scouts are focusing their recruitment efforts on the South Yorkshire and north Derbyshire areas. “I think it’s right because it gives you a strong identity,” Wadsworth says. “And the clubs with strong identities are usually the ones, over time, which end-up doing well.